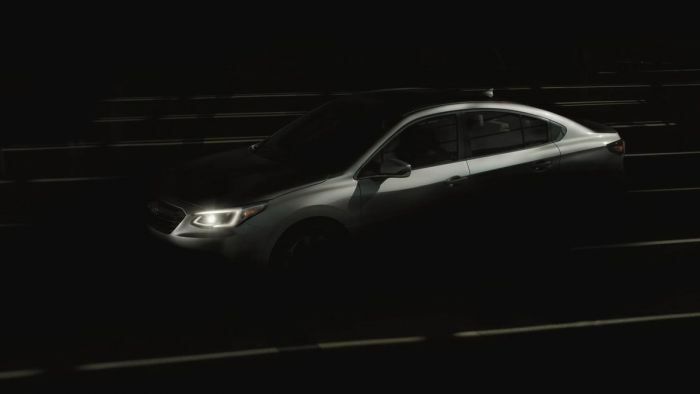 Subaru teases the all-new 2020 Subaru Legacy sedan before its world debut at the 2019 Chicago Auto Show. Here’s a sneak preview. When the all-new seventh-generation 2020 Subaru Legacy arrives later this year, the sedan will get a number of significant upgrades. It will also get one major engine change for 2020. It will be officially unveiled at the Chicago Auto Show on February 7, 2019, at the Subaru booth, but here’s what customers can expect when the all-new sedan arrives this summer. The first thing customers need to look for is the six-cylinder Boxer engine will likely be dropped from the Legacy lineup. The 3.6R’s demise is no surprise because Subaru Corporation spelled it out in their “Prominence 2020" plan. The plan outlines every Subaru boxer engine will come with the latest Direct Injection technology. You’ll see smaller turbo engines developing more power and with greater fuel efficiency in all new-generation Subaru vehicles. This is no surprise, but the exterior design language will remain conservative with Legacy just like the new fifth-generation Forester SUV. It’s not surprising design changes will be minor because the Japanese automaker doesn’t like to take risks. The new Forester has been criticized for its conservative styling, and it will continue with Legacy. The sedan will receive some updates, including a slightly redesigned front end and rear changes to the taillights, but don’t expect wild exterior design changes. Big changes are coming inside as the Legacy will grow in interior room because of the new Subaru Global Platform (SGP) offering a modular chassis. There will more legroom up front and in the back. Like the new-generation Crosstrek and Forester underpinnings, the new SGP will come with increased rigidity in the body and chassis translating to improvements in ride quality and handling, in addition to less noise and vibration in the cabin. This could be a good reason to wait if you are considering a 2019 Legacy. The 2020 Legacy will likely get the next evolution of Subaru’s EyeSight driver assist system and it will be standard on all trims. Subaru will incorporate further enhancements to EyeSight driver-assist technology, including radar, and highly accurate GPS and navigation systems. The Japanese automaker claims this will allow for automated lane-changes in certain conditions. The next-generation 2020 Subaru Legacy will keep its core values with a Boxer engine, and safety will be a strong point with EyeSight driver assist standard equipment. The Legacy is the only sedan in America that comes standard with all-wheel-drive, but sales are slipping as they have with all sedans in the U.S. market. Legacy will get the new SGP in 2020 and it will help revive interest in the sedan as sales have been steadily dropping the past three years. Subaru will likely have the new Legacy in showrooms this summer. The all-new 2020 Subaru Legacy will be unveiled at the press preview at 9:00 am CST February 7, 2019 at the Subaru booth. The Chicago Auto Show is open to the public February 9-18, 2019. Stay tuned. Thanks for managing our expectations Denis, LOL. I do like the new infotainment design as its been teased. That's about as radical as Subaru will get. I'm hopeful they go with the Ascent turbo since the 3.6R is gone and not do what they did to the Forester line-up (one engine fits all approach)... That would be a mistake, especially in the sedan segment where their competitors offer more power and starting to offer AWD versions as well (Nissan Altima).